We believe that our employees are our greatest asset. Our culture promotes collaboration, team-work and provides great opportunities for individual growth. At iNovate Solutions, you will be part of a great team of individuals who care deeply about the success of our clients and the personal development of our team members. You will find leaders who lead by example and excellent opportunities for charting your own course of career development. 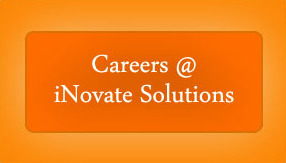 © 2011 iNovate Solutions, Inc.